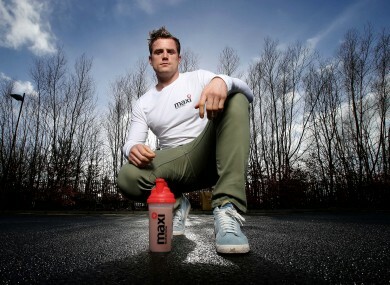 Jamie Heaslip is an ambassador for MaxiNutrition. Samuel Beckett’s words, but sentiments evoked by Jamie Heaslip as he reflects on defeat in Twickenham last Saturday. Ireland have certainly dealt with their fair share of failure in the last four years, but that won’t stop them trying again and again. And indeed, they did fail better against England this time around, their third consecutive loss against our closest Six Nations neighbours. As he looks back, Heaslip explains that his visit to the ongoing ‘Fail Better’ exhibition in Dublin’s Science Gallery has given him perspective. Heaslip admits that such a positive slant on the latest disappointment for Ireland was not present in “a dark changing room” in Twickenham following the game, admitting that he took an hour to even move off his spot in those pristine holding areas. But after benefiting from two days of rest, before training with Leinster on Tuesday and then rejoining the Ireland camp in Belfast yesterday, Heaslip has “parked” his dismay and is looking forward to the challenges that await with new vigour. The general consensus is that Ireland should and will make changes to their starting team for that home clash against the Italians, particularly with certain players having looked so fatigued in the closing stages of the England defeat. Heaslip admits that decisions on that front are totally out of the players’ hands, but the 30-year-old points out that neither he nor any of his teammates would take kindly to being omitted from the XV. One of the major positives Heaslip will carry forward into the Italian clash is the platform Ireland’s pack is providing from the set-piece. While a lack of powerful ball carriers meant the forwards were less effective in open phase play, the scrum was dominant against England. At the line-out, there was more excellent play and the maul – even if it didn’t reap the same rewards as against Wales – looked threatening again. Rarely has an Irish side looked so competent in these areas, and John Plumtree is the man being credited as heavily responsible for the transformation. Heaslip calls the former Sharks head coach a “very smart guy, very relaxed” influence, a “good bloke.” More importantly, he has hammered into Ireland’s forwards the importance of ‘fronting up’ in an old school manner. “He’s been around the game long enough to know how it works and how players work. I think he infuses a bit of pride in players in how they go about their work, especially the pack. He just makes you proud of what you do. Regarding the opportunity ahead of Ireland in the final two rounds, Heaslip is adamant that winning a championship would be just as special as securing the Grand Slam in 2009. Having mentioned the fact that IRUPA’s latest study into longevity highlighted that the average length of a rugby player’s career now stands at seven years, Heaslip knows Ireland are running out of chances. I think it’s all about winning, you know? Winning silverware; you want to be able to lift something at the end of the competition. You can’t get too far down the line, but for me it’s all about winning. Failing better can be important along the way but for this group of Irish players, it’s time to wrap those lessons into a two big wins as the Six Nations comes to a conclusion. Ireland stars Jamie Heaslip and Conor Murray have been announced as the new MaxiNutrition ambassadors, as Maximuscle relaunches as MaxiNutrition in Ireland. The UK and Europe’s leading sports nutrition brand is launching a new product range and campaign. For more information on MaxiNutrition products visit http://www.maximuscle.com. Email “Heaslip: 'You've got to learn from your mistakes and fail better'”. Feedback on “Heaslip: 'You've got to learn from your mistakes and fail better'”.